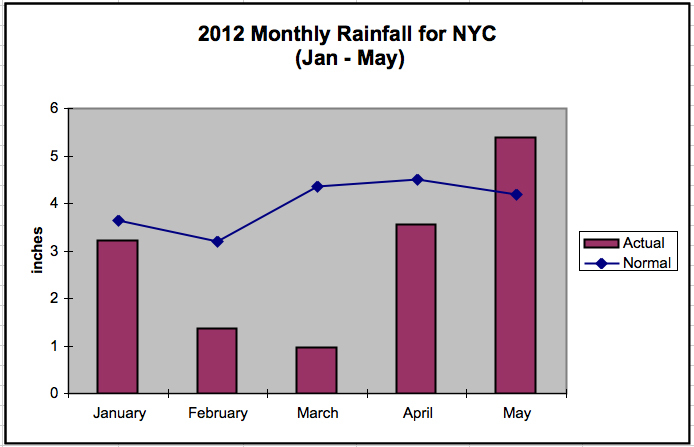 Overall, New York City was warm and soggy this May. Despite a cool start, we finished the month with an average temperature of 65.1°F, which is 3.1°F above normal. The stretch of very warm days at the end of the month helped contribute to this above average reading. Precipitation was above average as well. The city saw 5.38 inches of rain in Central Park. That is 1.19 inches above normal. This was the first time we had above average rainfall since October 2011. New York City, however, is still 5.41 inches below average for the year. As a result, the city is currently listed as “abnormally dry” on the U.S. Drought Monitor.